Whirlpool washer md# mvwx700xl2. This is a VMW that drains and continues draining at 23 and 13 minutes without advancing. Removed error code f 9- e1 and f o - e 2. 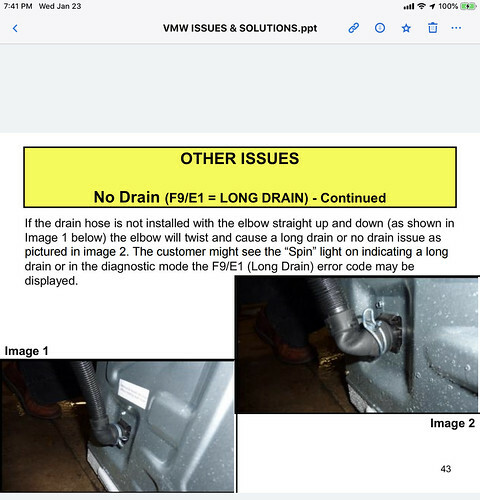 Indicates long drain and over Suds condition. Cleared these codes out tested unit successfully in automatic and manual test mode. Also recalibrated. Still having the same issue. Was wondering if someone had experienced this problem and could give some feedback thank you. When my customer returns from her holiday I will try service pointer w10683100 and give followup. Not sure if this will solve the problem or not. Are you sue it’s draining all the water out of the tub? Those pumps are garbage. 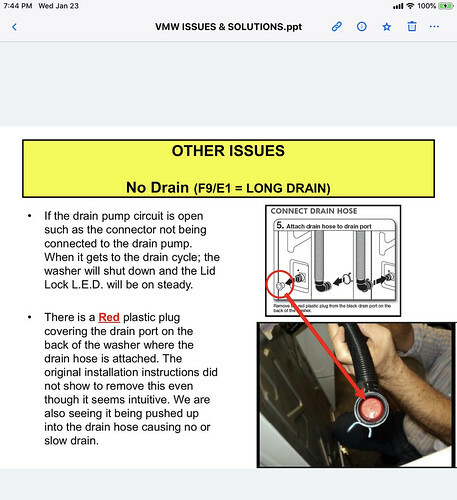 What I mean is maybe it’s just draining some of the water out and leaving just enough water in the tub (just under the wash plate or under the basket and you can’t see it) that the pressure switch is sensing it. I seen them pump for awhile then just lock up or run and not pump out. Also bad crimps on the wire connection to the pump. I just cut them off and put new connectors on. A lot of times you can’t see this and wiggle the wire and the pump takes off. If it is for sure pumping all the water out then I would replace the board because I would suspect the pressure switch on the board is bad. Okay finally an update on this washer. Customer has been on holiday out of state for a number of weeks anyway replacing control board problem solved. Unit was draining continuously at either 23 minutes or 13 minutes for a very long time and then timing out to a blank screen. Computer issue problem solved.